With such a flood of outstanding archive material constantly being transferred to disc, the beginning of a new recorded Ring cycle is no longer quite the event it used to be. But the arrival of a new cycle made available at a super-budget price would be hard to ignore even if it was only half decent, and to judge from this first instalment, the Naxos Ring could be much better than that. The plan is for Jaap van Zweden to conduct the four music dramas in concert with the Hong Kong Philharmonic across four years, and for an edited recording to be released on disc later the same year. This Rheingold comes from a pair of performances given in the Hong Kong Cultural Centre in January this year; Die Walküre is scheduled there for the beginning of 2016. Van Zweden established his credentials as a Wagner interpreter with the superb Parsifal that he conducted in the Amsterdam Concertgebouw in 2010, which subsequently appeared on Challenge Classics. The qualities that marked out that performance characterise this recording of Rheingold, too. The orchestral textures have a spaciousness and transparency, and an unforced sense of architectural shaping and dramatic flow; some may prefer their Wagner more monumental and confrontational, but that is not Van Zweden’s way. In terms of classic Rings on disc, his approach is much closer to that of Herbert von Karajan than any other conductor. But the real surprise here is Matthias Goerne’s performance as Wotan. His handling of the text is as exemplary as anyone would expect from such a seasoned lieder singer, but it’s the power and gravitas that Goerne brings to the role that are so startling. There’s real dark authority to the lower reaches of his voice, and a range of colour of the upper registers that conjures up an intriguingly complex character psychologically; I can’t tell how much of that would be conveyed in a stage performance, but on disc it sounds extremely effective. The rest of the cast may not quite be on the same level, but there are still some very fine contributions. Peter Sidhom’s Alberich combines real malevolence with a touch of the panto-mime villain; Kim Begley’s Loge is a mixture of quick intelligence and darker, deeper intent. As Fricka, Michelle DeYoung’s time will surely come in the next instalment, Walküre; here she does everything that’s required of her. Kwangchul Youn and Stephen Milling are a robust pair of giants, David Cangelosi a not too caricatured Mime, and Eri Nakamura, Aurhelia Varak and Hermine Haselböck make a nicely differentiated trio of Rhinemaidens. Unfussily, but very lucidly recorded, it’s altogether a promising start to the cycle, and the next instalment of the epic, which, as well as Goerne and DeYoung, is scheduled to include Stuart Skelton as Siegmund and Petra Lang as Brünnhilde, should be well worth hearing, too. 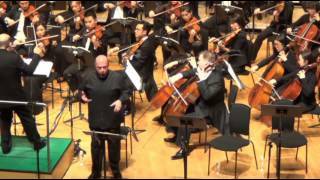 Taken from two concert performances in January, 2015, this is the first installment of an entire Ring Cycle from the Hong Kong Philharmonic under Jaap van Zweden to be recorded by Naxos. It makes you hungry for the rest. The recording is clean and clear, with no artificial anything. Van Zweden’s approach is closest in memory to Herbert von Karajan’s–intimate and chamber-like, a family drama that happens to be played out in magical, mythological terms. Also like Karajan, van Zweden takes his time (at 2 hours and 33 minutes, this is on the longish side) and offers seamless segues between scenes. When a solo instrument is featured in Wagner’s dense orchestration, it is given a spotlight, and beautiful moments are to be bathed in–the motif after the Rainbow Bridge is created and the singing that follows rarely have sounded so tuneful and lovely. The Hong Kong Philharmonic is not Berlin or Vienna or the Met, but it has nothing to fear–the playing throughout is smooth and handsome. The opening Rhine passage is dark but clear, the piling up of the gold in Scene IV is beautifully built, and the opera’s final moments are indeed the grandest, as they should be–one of the few instances when van Zweden pulls out all the stops. The back and forth between the fine, unexaggerated Fricka of Michelle De Young and the remarkable, surprising Wotan of Matthias Goerne is natural and familiar, and Goerne is the surprise of the performance. His experience and expertise as a Lieder singer comes in very handy in this opera: his interacting with Loge and his cajoling of Mime and Alberich all are textually and dynamically right-on. The bottom of the voice sounds remarkably rich, and while the top notes are brighter than we normally hear, he has authority. One wonders, however, about his Walküre Wotan…. David Cangelosi’s slimy Mime is vivid and actually sung–note for note, and Kim Begley’s Loge is performed with wonderful detachment: he knows he’s smarter than anyone else. Deborah Humble’s Erda could have been darker-hued, but her attention to the text turns her scene into the “event” it should be. Anna Samuil’s Freia is much like every other soprano’s who sings the part: good at complaining and being afraid. Kwangchul Youn’s Fasolt is on a grand scale; Stephen Milling’s Fafner not so much. Froh, small part though it is, deserves a better profile than Charles Reid gives it, and the Donner of Oleksandr Pushniak begins his “Heda…” on an unsteady note but recovers quickly. The Rhinemaidens–Eri Nakamura, Aurhelia Varak, and Hermine Haselböck–are a terrific, articulate, tuneful trio. Well, there are disappointments: How are you going to knock ’em out in the anvil scenes after they’ve heard Culshaw’s Decca Rheingold? Here we get something more like tinkly chains. Similarly, the big music introducing Erda goes by unnoticed, and so does the outburst after Alberich’s Curse. As suggested, van Zweden keeps the big sound for the finale–it’s all in the plan. And like Karajan’s, it’s a good approach but occasionally lacks the grandeur we want from moments in this opera. First choice among Rheingolds is still the Decca, but Testament’s release of a 1955 Bayreuth performance with Hans Hotter is certainly in the running, and as a non-gimmicky performance, may even be better. But this new set gives a wonderful overall view of this opera, and at a remarkable price. Following a collection of historic Metropolitan Opera broadcasts and the taking-over of the soundtracks from the four-director Stuttgart anniversary cycle, Naxos now starts its third Ring. Taken from concerts by Jaap van Zweden’s Hong Kong Philharmonic (there’s Blu-ray Audio as well), this Rheingold, despite some effective casting and a rich-sounding natural balance, is a curate’s egg of a performance. On the plus side, the Hong Kong Philharmonic sound fully up for the occasion and have the stamina for this demanding piece. Van Zweden, in what is apparently quite a small hall, takes care never to cover his voices. He enjoys quieter passages – such as the colour and intricacy of Wagner’s wind commentary in Loge’s taunting of the gods’ growing old, or Mime’s narration – but is not always so sure-footed in the more heroic moments or the often vicious irony that governs the humour of this text. He also has a tendency to prepare for each new melodic idea or theme by holding back the end of the preceding music, as if delayed by an awkward page-turn in the score. Matthias Goerne sings Wotan beautifully, with much baritonal sophistication, predictable (from an experienced Lieder recitalist) care for words and able negotiation of trickier moments. He is also capable of (and, unlike some other Wotans, willing to give voice to) genuine anger at his opponents. Unsurprisingly, at the beginning of his time with this role, not every aspect of the character is yet fully in focus. The experienced Kim Begley (and van Zweden) likes to take Loge fast – authentic but a little short-changing of those moments of sarcasm so relished by past interpreters such as Windgassen and Emile Belcourt. Peter Sidhom enjoys himself greatly playing Alberich as an out-and-out ‘baddie’ with cackling laughter. The conductor’s handling of Erda’s intervention – too broken up in its phrasing to maintain a strong line of narrative – and the main giants’ scenes – beautifully played but insufficiently forceful – does not wholly mesh with some able singing from Deborah Humble, Kwangchul Youn and Stephen Milling. The scene in Nibelheim does come off well. Here it feels as if David Cangelosi’s Mime, both funny and moving without any kind of braying excess, has acted as catalyst to turn the occasion into a more full-on dramatic performance. NAXOS’s new recording of Richard Wagner’s Das Rheingold is a celebration of new beginnings. In addition to preserving the rôle débuts of two of today’s most lauded singers, this recording launches a complete Der Ring des Nibelungen that will be the first such effort by an orchestra in Hong Kong and all of mainland China, as well as its conductor’s inaugural Ring. Were those its only virtues, it would be a worthwhile addition to the Rheingold discography, but the strengths of this Rheingold extend far beyond these impressive firsts. Recorded in the Hong Kong Cultural Centre’s state-of-the-art Concert Hall during two widely-lauded concert performances in January 2015, the recording is a technological triumph overseen by producer and engineer Phil Rowlands, whose expertise has produced a recording that satisfies both as a faithful reading of Wagner’s sonically thrilling score and as a memento of the frisson of this important occasion. Neither performances nor recordings of Das Rheingold are rare, but performances and recordings of the quality of this one, distinguished by the participation of a splendidly-selected cast, are no more common than giants and Rhinemaidens. One of the most prevalent themes in Classical Music during the past decade has been the primacy of NAXOS releases among the finest new recordings, and this Rheingold is an exceptionally musical variation on that theme. Founded in the last decade of the Nineteenth Century as an amateur ensemble, the Hong Kong Philharmonic Orchestra assumed the form in which it is heard in this Rheingold as recently as 1974. Under the direction of esteemed Asian and Western-born Music Directors including Ling Tung, Kenneth Schermerhorn [familiar to NAXOS aficionados as the much-lamented Music Director and Principal Conductor of the Nashville Symphony], David Atherton, Samuel Wong, and Edo de Waart, the HKPhil has grown into one of the world’s finest orchestras and a beacon for native and international talent. The orchestra’s current Music Director, Dutch violinist [the breadth of his talent is intimated by his having become the Royal Concertgebouw Orchestra’s youngest concertmaster at nineteen], conductor, and composer Jaap van Zweden, established his credentials as a Wagnerian on disc with a compelling performance of Parsifal with the Radio Filharmonisch Orkest on the Challenge Classics label, also recorded in concert. The insightful management of orchestral textures and psychological depth that characterized van Zweden’s conducting of Parsifal also course through this recording of Das Rheingold. The HKPhil musicians respond to his leadership with feats of virtuosity that rival the best playing of the Staatskapelle Dresden and the Wiener Philharmoniker. Whether by virtue of near-perfect playing or judicious editing of material from the pair of performances, the orchestra’s contributions to this performance would be welcomed with fervent ‘Bravi’ at Bayreuth. The opera’s Vorspiel here develops, as it should, from a silent abyss—hardly an easy accomplishment in the context of a live recording!—into the primordial clamor of disrupted nature, lusty giants, and obstreperous deities, and there is no mistaking in this performance the fact that the seeds of the scene-change music in Richard Strauss’s Die Frau ohne Schatten and the Interludes in Britten’s Peter Grimes were sown by Wagner in the Einleitung before Scene Two and the Verwandlungsmusik before Scene Three of Das Rheingold. Van Zweden’s tempi are occasionally idiosyncratic, the pacing sometimes seeming slightly deliberate, but momentum is maintained impressively, creating a pervasive sense of dramatic tension despite the inherent stasis of the concert format. Van Zweden is attentive to Wagner’s differentiations of the sonic landscapes of the Rhinemaidens, the giants, and the gods, limning the musical boundaries of each realm with taut rhythms for the mortals and expansive phrasing for the denizens of the newly-built Walhalla. The machinery of the Nibelung dwarves’ sweatshop, famously represented in Wagner’s score by eighteen tuned anvils, here sounds more like the clinking of cutlery in a well-appointed kitchen, but the orchestra’s playing, bolstered by marvelous performances by brasses and woodwinds, is consistently on an aptly Wagnerian scale, and van Zweden paces a performance of grandeur and gravity. Substantially completed by the autumn of 1854 but not performed until 1869, Das Rheingold both brought the precepts outlined in Wagner’s 1851 tome ‘Eine Mittheilung an meine Freunde’ to fruition and broadened the scope of the Ring as a whole, which Wagner had originally conceived as a trilogy rather than the tetralogy that it became with Das Rheingold. For modern audiences, Rheingold introduces the characters and themes that shape the dramas of the three subsequent works, Die Walküre, Siegfried, and Götterdämmerung. First heard are the sometimes playful, sometimes portentously prophetic Rhinemaidens, the guardians of the gold fashioned into the ring that brings gods’ and men’s destinies into conflict. With soprano Eri Nakamura as Woglinde and mezzo-sopranos Aurhelia Varak and Hermine Haselböck as Wellgunde and Floßhilde, the performance begins with the tuneful frolicking of an appealing trio of Rhinemaidens. The ladies’ euphonious singing of ‘Weia! Waga! Woge, du Welle’ sparkles like sunlight on the water’s surface, and each voice is both individually and collectively ideal for the music. The good-natured teasing of Alberich has in this performance an obvious core of vulnerability, but there is nothing insecure in the ladies’ singing. Their voicing of ‘Lugt, Schwestern! Die Weckerin lacht in den Grund’ crackles with girlish verve, and the avidity with which they sing ‘Nur wer der Minne Macht entsagt’ is telling. Nakamura’s, Varak’s, and Haselböck’s vibrant exclamation of ‘Haltet den Räuber!’ evinces panic without being undermined by vocal flaws. In the final scene, the trio’s shimmering ‘Rheingold! Rheingold! Reines Gold!’ ends the performance with a surge of truly golden sound, the demands of the tessitura met with unassailable conviction by all three ladies. The giants Fasolt and Fafner are sung with sonorous malevolence and subtle hints of humor by basses Kwangchul Youn and Stephen Milling. Youn brings to Fasolt’s ‘Sanft schloß Schlaf dein Aug’!’ a voice that sounds as though it was mined of the earth’s sturdiest ore, and the power with which he projects ‘Was sagst du? Ha! Sinn’st du Verrath?’ is gladdening. In Scene Four, Youn sings ‘Halt, du Gieriger! Gönne mir auch was!’ with steely authority that is the hallmark of his performance as a whole. As Fafner, Milling is a blood-curdling thug from the start, already very nearly a dragon! The reptilian smugness of his delivery of ‘Du da folge uns!’ is matched by the explosive intimidation of his ‘Hör’ Wotan, der Harrenden Wort!’ In Scene Four, Milling hurls out ‘Gepflanzt sind die Pfähle nach Pfandes Maß’ and ‘Nun blinzle nach Freia’s Blick!’ with abandon. Fasolt and Fafner do not require vocal beauty, but hearing their music sung so capably, without allowances having to be made for lapses in stability and intonation, heightens appreciation of the care with which Wagner gave life even to these hateful characters. Alberich is portrayed with snarling menace by baritone Peter Sidhom, who, despite being unafraid of distorting the voice in service to his depiction of the character’s agenda, ultimately sings the part with greater fidelity to Wagner’s score than many recorded Alberichs. In the opera’s first scene, he dispatches ‘Hehe! ihr Nicker’ with the forcefulness of a gunshot, and Sidhom’s increasingly agitated, unsettling articulations of ‘Garstig, glatter glitschriger Glimmer!’ and ‘Der Welt Erbe gewann’ich zu eigen durch dich?’ are electrifying. Here and especially in Scene Three, the part’s highest notes trouble Sidhom, who must sometimes resort to shouting, but his portrait of the embittered Nibelung is laudably consistent. The baritone’s account of ‘Hehe! Hehe! Hieher! Hieher! Tückischer Zwerg!’ is invigorating, and in both ‘Schau, du Schelm!’ and ‘Die in linder Lüfte Weh’n da oben ihr lebt’ Alberich’s nefarious intentions scintillate in Sidhom’s singing. The opera’s final scene prompts Sidhom to give broad expression to Alberich’s frustration. His ‘Wohlan, die Niblungen rief ich mir nah’ and ‘Gezahlt hab’ ich nun laß’ mich ziehn!’ exude hatred and a burgeoning quest for vengeance. Sidhom is an Alberich who epitomizes villainy without caricature, and his considered, confident singing inspires sympathy for the character’s suffering. Tenor David Cangelosi is, as he has been in a number of Ring productions, a wily, wheedling Mime who sings the rôle more comfortably than many Mimes heard in recent years. Throughout the performance, Cangelosi’s Mime is like a live wire, showering every scene in which he appears with dramatic sparks. The tenor’s tones are not always conventionally attractive or ideally-placed, but the Mime that he portrays is an appropriately unpleasant figure who is tolerated by the other characters only with considerable restraint. Cangelosi sings ‘Nehmt euch in acht! Alberich naht!’ obsequiously but with ringing tone, and his use of text throughout the performance is masterly. Cangelosi manages to make Mime interesting rather than merely repulsive, and his vocalism is gratifyingly fluent. Though the voice has tremendous presence, baritone Oleksandr Pushniak is unfortunately only a partially successful Donner, his stentorian singing of ‘Heda! Heda! Hedo!’ and ‘Bruder, hieher! Weise der Brücke den Weg!’ when summoning the thunderstorm in Scene Four impaired by unsteadiness. Vocal instability is perhaps a family trait, as tenor Charles Reid’s alert, verbally sharp-witted Froh is also weakened by tremulousness, especially above the stave. Both gentlemen create sharply-defined characters whose parts in the drama they uninhibitedly fulfill, but their intelligent, accurately-tuned performances are too often compromised by vocal unevenness in moments of significance. As Freia, the object of the giants’ disgusting desire, soprano Anna Samuil’s effervescent singing leaves no doubt of why she is such an irresistible prize for Fasolt and Fafner. The golden apples that preserve the gods’ youth seem to glisten in Samuil’s singing, but the terror that emanates from her pleas to be rescued from the giants’ unmistakable designs is bracing. Unlike many Freias, Samuil scales the upper reaches of her music without shrillness. Her singing of ‘Schwester! Brüder! Rettet!’ pierces the musical tapestry of the performance like a dagger. Offering tones of meteoric allure, Samuil’s Freia is a woman any self-respecting brothers would move heaven and earth to save from the clutches of libidinous oafs. It no longer seems possible that this abused, broken planet could sing with a voice as strong and beautiful as that of Australian mezzo-soprano Deborah Humble, and the direness of her Erda’s warnings to Wotan are all the more chilling for being so splendidly sung. Humble invests troves of rich, burnished tone and unerring dramatic instincts in her performance of ‘Weiche, Wotan, weiche!’ The result is one of the most compelling recorded accounts of the brief but crucial rôle, one in which every note of the part is wholly in the voice and no compromises are required. Humble rivals Lili Chookasian and Oralia Domínguez for sheer vocal quality and uses German text as imaginatively as Maria von Ilosvay and Marga Höffgen. Arrogant and foolish indeed is the Wotan who fails to heed the counsel of such an Erda! British tenor Kim Begley is the uncommon veteran of Wagner and Richard Strauss rôles whose carefully-honed technique and well-judged performances have preserved the beauty and flexibility of the voice, and he sings Loge in this performance with nimbleness and finesse which many younger singers should envy. Ever an imaginative artist, Begley makes much of the text, his diction giving his singing of ‘Immer ist Undank Loges Lohn!’ additional bite. He infuses ‘Ein Runenzauber zwingt das Gold zum Reif’ with unexpected nuances, establishing Loge as the sole fount of reason and understanding in Das Rheingold. In Scene Three, Begley’s reading of ‘Nibelheim hier: durch bleiche Nebel’ is appealingly forthright, and he shapes both ‘Ohe! Ohe! Schreckliche Schlange’ and ‘Dort, die Kröte! Greife sie rasch!’ with the intuition of a born Wagnerian, accentuating key words without altering the emphases in Wagner’s phrasing. He unleashes a world-weary fury in ‘Da, Vetter, sitze du fest!’ in Scene Four, furthered by his bright enunciation of ‘Ist er gelöst?’ Begley phrases ‘Lauschtest du seinem Liebesgruß?’ with bel canto grace, the voice flowing through the music with far greater pulchritude than many listeners might think possible in Wagner repertory. This is one of Begley’s finest recordings and a Loge that rivals the best interpretations on disc. Solely among recorded performances of Das Rheingold, American mezzo-soprano Michelle DeYoung must endure comparisons with many of the greatest Wagnerians of the past century as Fricka. Having recently garnered acclaim for her vocally and dramatically voluptuous Venus in the Metropolitan Opera’s revival of Tannhäuser, DeYoung here establishes her Fricka as a worthy successor to celebrated interpretations of the rôle by Elisabeth Höngen, Ira Malaniuk, Rita Gorr, and the incomparable Kirsten Flagstad, whose Fricka in the DECCA studio recording conducted by Sir Georg Solti remains one of the most-debated performances on disc. DeYoung’s vocalism is ungainly to a degree, and she is most effectively in her element when under greatest stress, but the voice is a legitimate Fricka instrument that possesses metal and femininity in equal measures. The mood that she conjures with her granitic ‘Wotan, Gemahl, erwäche!’ is one of consummate political dominance, Fricka’s moral authority outweighing Wotan’s ambition. DeYoung deploys mountains of tone in ‘So schirme sie jetzt’ and ‘Wotan, Gemahl, unsel’ger Mann!’ In the lower register, where Fricka’s music often takes her, she can summon the focus of a contralto with velvety sumptuousness that contrasts stunningly with the laser-like upper register, the top of the voice essentially that of a dramatic soprano. In Scene Four, DeYoung envelops her rousing statement of ‘Lieblichste Schwester süsseste Lust!’ with sisterly concern and spousal scorn. DeYoung’s performance leaves nothing to chance, her first effort at portraying Fricka disclosing a commendable absorption of the rôle. A number of Frickas have credibly conveyed the aggrieved wife’s contempt for Wotan’s misadventures, but few singers have given voice to her protestations as unfalteringly as DeYoung does in this performance. As a Wotan admired for remarkable perspicacity as an interpreter of Lieder rather than Wagnerian declamation, baritone Matthias Goerne has much in common with his storied countryman Dietrich Fischer-Dieskau. Goerne shares his illustrious predecessor’s poetic approach to text and seemingly boundless palette of vocal colors, but in his first portrayal of Wotan it is George London rather than Fischer-Dieskau whose example Goerne’s singing brings to mind. Unlike Fischer-Dieskau, who encountered passages in Wotan’s music that required more voice than he could supply, Goerne possesses the range and the orotundity of tone for the part, which he plays with machismo and bristling pride. Having waited to sing Wotan until he had experience with a character like Berg’s Wozzeck under his belt, Goerne here makes one of the most auspicious rôle débuts in recent memory. The soaring sovereignty with which he phrases ‘Endlich Loge! Eiltest du so,’ a passage of which many Wotans make little, is indicative of his intuitive grasp of both the character and his music. Throughout the first half of the opera, Goerne alternates petulance with pure muscle in depicting Wotan’s shifting allegiances and thirst for power. Facing Fricka’s withering disdain and the bungling turpitude of the giants and Nibelungs, Goerne’s Wotan assumes the capacity of unanswerable supremacy, taking command in​ Scene Four with an imposing account of ‘Soll ich sorgen und fürchten.’ Greeting Walhalla, his perceived refuge from the perils and responsibilities of wielding the ring, Goerne sings ‘Abendlich strahlt der Sonne Auge’ stunningly, complemented by a poised but pointed ‘So grüss’ ich die Burg.’ Few singers have elucidated the motivations and flaws of the Rheingold Wotan at any points in their careers as Goerne here does in his first attempt. Heartening as the profundity of his interpretation of the rôle is, it is his singing that wins the greater share of the laurels. Any listener who continues to believe that tired barking is the trademark of a successful Wotan should hear this performance. Goerne’s singing harkens back to past generations, when Wotans like Friedrich Schorr, Hans Hotter, and George London revealed that brawn need not impede beauty. Die Walküre is the Ring opera that works best beyond the context of the complete Cycle, but Das Rheingold is in many ways the most accessible of the four works that comprise Der Ring des Nibelungen. There is a concentrated circumspection in Rheingold’s uninterrupted narrative that is not duplicated elsewhere in Der Ring, and Wagner’s music at once occupies a lofty plane of inspiration and exemplifies effective theatricality. The observer who suggests, perhaps because of its less-daunting dimensions, that Das Rheingold is an ‘easier’ piece than Die Walküre, Siegfried, and Götterdämmerung has surely never been involved with performing, producing, or recording it. This NAXOS recording of the Hong Kong Philharmonic’s Rheingold, the first installment in a complete Ring Cycle scheduled for realization in increments by the end of 2018, is an achievement for which every participant and all Wagnerians must give thanks. Its weakest link is far from ruinous, and its foremost strengths—the Wotan of Matthias Goerne, the playing of the Hong Kong Philharmonic, and the conducting of Jaap van Zweden—foretell a Ring to challenge notions of great Wagner performances being solely things of the past. These performances of the opening drama of Wagner’s Ring both originate in concert performances. The Rattle production was recorded over two days at the Hwerkulessaal in Munich (April 24-25, 2014), while van Zweden and the Hong Kong Philharmonic were recorded at the Hong Kong Cultural Center Concert Hall (January 22 and 24, 2015). The van Zweden Rheingold is the beginning of a complete Ring for Naxos, but I am not aware of similar plans from BR Klassik for Simon Rattle and the Symphonieorchester des Bayerischen Rundfunks. Concert performances have some, but by no means all, of the immediacy and power of a live recording. At the same time, though, they provide a more controlled environment for acoustic fine-tuning and post-production editing, particularly important for the Naxos issue, which is (to the best of my knowledge) the first Wagner music drama to be recorded in Blu-ray audio. Both recordings have excellent sound quality. The Hong Kong Philharmonic is not known as a Wagner orchestra, but it clearly has aspirations in that direction. The current Ring project is the first cycle undertaken by a Chinese orchestra. Jaap van Zweden, who is simultaneously music director at the Hong Kong Philharmonic and at the Dallas Symphony, is a good choice for the podium. He is an excellent Bruckner conductor and his concert performance of Parsifal with the Netherlands Radio Philharmonic (on Challenge Classics) was well received, and deservedly so. The Symphonieorchester des Bayerischen Rundfunks operates of course at a different level of visibility, particularly with Sir Simon Rattle at the helm. Wagner, however, is relatively under-represented in Rattle’s repertoire and discography, with his first Ring conducted at the Festival d’Aix-en-Provence from 2007 – 2009 (and subsequently released on Blu-ray). Of the two conductors Rattle has much more fluidity, particularly with the strings. Van Zweden is flatter and communicates less energy and momentum. The contrast is particularly clear in the closing minutes of the Prelude, which Van Zweden conducts like the prelude to Das Rheingold, whereas Rattle shapes it as the prelude to the entire Ring cycle. Throughout the performance Rattle is more effective at foregrounding the forward-looking references in the score. The Hong Kong Philharmonic is most effective in the more intimate, chamber-like sections, but falls somewhat short when drama is called for – such as, for example, the journeys to and from Nibelheim – not helped by occasional disjointedness in, e.g., the scene with the giants. Rattle, in contrast, is at the monumental end of the spectrum. I think that this works well for him in Das Rheingold, which is not easy to bring off (as a single uninterrupted block of music of well over two hours, without any of the cycle’s signature episodes). Interestingly, van Zweden is 10 minutes or so longer than Rattle. Of the two casts the finest single vocal performance comes from Matthias Goerne as Wotan. As a highly experienced lieder singer his enunciation and articulation are of course excellent, and he has the vocal presence to sing Wotan successfully. We will have to wait until Die Walküre to see how Goerne copes with the real depths of the character, but all the indications are very promising. Michael Volle’s Wotan for Simon Rattle is definitely lighter and overall less impressive, but still dramatically satisfying. In fact, there are no real weak links in the chain in either performance. Highlights from van Zweden’s cast include Kim Begley’s Loge and Michelle de Young’s Fricka. The first is sung without the tendency to caricature that some singers feel necessary in Loge, while Fricka is less petulant than she often appears. Burkhard Ulrich and Elisabeth Kulman sing the same roles well for Rattle. Peter Sidhom’s Alberich (in the Hong Kong cast) has fine moments, but the performance is marred by exaggeration at crucial moments (e.g. both of Alberich’s curses). I found Rattle’s Alberich (Tomasz Konieczny) more balanced. Rattle’s Erda (Janina Baechle) has a fine tone, but sounds a little too light for the weight of her message. The various giants and gods are all well sung, with Kwangchul Youn’s Fasolt (for van Zweden) particularly standing out. Both of these sets have their merits. There is some very fine singing from van Zweden’s cast, particularly Matthias Goerne, while Rattle and the Symphonieorchester des Bayerischen Rundfunks take the orchestral honors. The Hong Kong performance has the advantage of being recorded on Blu-ray audio and offers a surround sound option (DTS-HD 5.1). I don’t think that either will force its way to the front of a very large field, but each is certainly worth listening to, and I look forward to the next installments of van Zweden’s cycle with the Hong Kong Philharmonic. Though Das Rheingold was the first opera to be written in Wagner’s Ring cycle, it was the last to be completed libretto-wise. Wagner realized the need for a prequel to the Ring, and so it comes as no surprise that the work often serves as a standalone performance in many instances, seeing as how it is the shortest of the cycle and in many ways the simplest in terms of musical references and overall presentation. However, Wagner was not one to waste time on superfluous activity, so the personality development and initial debut of characters is paramount for what was to follow, even if the opera can stand alone. For this reason I can recommend this new surround sound release (especially if you have a Blu-ray player), especially because of the surprisingly adroit and versatile performance of baritone Matthias Goerne, with Peter Sidhom’s colorful Alberich a close second. The other positions are ably-filled, noticeably the Fricka of Michelle DeYoung, though not as consistently cast as some other more recent recordings. It is a concert performance, and therefore there are no stage sounds, but the voices, probably because of the miking, are somewhat close, reducing the impact of the orchestra, which is something that Wagner himself would have had issues with. Nevertheless, the sound spread is nice and wide, and this is an enjoyable, though quite leisurely, tour through the Rhine Gold. As alternatives I would be remiss in not mentioning Janowski on Pentatone SACDs, Gergiev on Mariinsky SACDs, or most importantly, the newly-remastered Blu-ray issue of Solti’s classic recording, still regarded by most as the greatest ever. But Zweden is certainly worth a try. Naxos presents Jaap van Zweden and the Hong Kong Philharmonic in their first ever Ring, rarely the best idea. However, the cast is compensatingly strong, even stellar. Peter Sidhom’s dark-leather tone and malevolent characterisation make an impressive Alberich, fellow Briton Kim Begley is a smooth, sardonic Loge, ideally lyrical in his narration, and Mathias Goerne, no less, sings Wotan. While his dark-velvet bass-baritone sometimes recalls the great Hans Hotter, though, Goerne’s prosaic characterisation, underdeveloping the god’s headstrong charisma, is surprising in such a distinguished lieder singer. Stephen Milling’s and Kwangchul Youn’s giants, David Cangelosi’s Mime, and Anna Samuil’s Freia continue the luxury casting, along with excellent lesser gods, especially Erda, and a really lively Rhinemaiden trio. Van Zweden conducts with an easy sweep that would carry one along in the opera house, drawing some splendid sound from the orchestra, but recording highlights how much of Rheingold’s pointed dramatic detail he doesn’t yet catch, at the fulfilment of the Valhalla motif, for example. The anvils sound curiously gamelan-like. What makes this most remarkable, therefore, is the price. This knocks spots off rival bargain versions, especially Naxos’s earlier Stuttgart recording, and many more expensive – and on audio Blu-ray it should sound superb. Als vor ein paar Jahren Jaap van Zwedens Aufnahme von Wagners ‘Parsifal’ erschien, wurde diese allgemein sehr positiv aufgenommen und es wurde insbesondere van Zwedens Dirigat hervorgehoben. Was uns der holländische Dirigent nun aber mit diesem ‘Rheingold’, dem Auftakt eines kompletten neuen ‘Ring’ aus Hong Kong, zumutet, ist inakzeptabel. Das Positive ist schnell, sehr schnell aufgezählt. Da gibt es ein wundervolles Rheintöchter-Trio und mit dem Tenor Charles Reid einen um Stil bemühten Froh. Dann kommt noch etwas Mittelmaß (David Cangelosi als Mime, Anna Samuil als Freia und Deborah Humble als Erda), doch das ist alles viel zu wenig, um diese ‘Rheingold’-Aufnahme konkurrenzfähig zu machen. Die tragenden Rollen sind entweder mit Sängern besetzt, die über ihren Zenit hinaus sind (Kim Begley als Loge, Kwangchul Youn als Fasolt), stimmlich inakzeptabel (Oleksandr Pushniak als Donner, Peter Sidhom als lispelnder Alberich) oder einfach nur fehlbesetzt. Besonders tragisch ist das bei Matthias Goerne als Wotan und bei Michelle DeYoung als Fricka. Der von mir hoch verehrte Goerne singt, als stünde er unter Drogen: keine Emotion, keine Gestaltung, nur ein undifferenzierter, immer gleichbleibender Gesang, der nur eines verbreitet: endlose Langeweile! Zudem ist Goernes Stimme viel zu tief für die Rolle des Wotan und es fehlen ihm sowohl die nötige dramatische Höhe wie auch die von der Oper verlangte stimmliche Wendigkeit. Michelle de Young ist eine keifende Fricka mit viel Tremolo und einem sehr unattraktiven Gesang. Wer diese Sängerin noch vor einigen Jahren in Bestform erlebt hat, wird vom Verfall dieser einst schönen Stimme erschreckt sein. Jaap van Zweden dirigiert ohne Engagement, ohne Leidenschaft und ohne Gefühl für den Parlando-Charakter der Oper. Daran sind wohl auch die sehr langsamen Tempi schuld, die der Dirigent nicht mit Innenspannung ausfüllen kann und die somit auch keine Lebendigkeit aufkommen lassen. Wenn sich auch das kaum geforderte ‘Hong Kong Philharmonic Orchestra’ beachtlich aus der Affäre zieht, so ist dies für mich doch mit Abstand eine der schlechtesten ‘Rheingold’-Aufnahmen der gesamten Diskographie. Schlicht wie die Verpackung ist auch das, was drinnen ist. Mit Richard Wagners Rheingold hat Naxos einen neuen Ring des Nibelungen gestartet (8.660374-75). Im kommenden Jahr soll die Walküre folgen, innerhalb von vier Jahren das gesamte Projekt zum Abschluss kommen. Kleingedruckt ist zu lesen, dass es sich um einen Mitschnitt aus der Hong Kong Cultural Centre Concert Hall mit dem dort ansässigen Philharmonic Orchestra handelt. Dirigent ist Jaap van Zweden. Es gab zwei Aufführungen, nämlich am 22. Und 24. Januar 2015. Daraus wurde sich bedient. Das ging erstaunlich schnell und spricht für die Professionalität des Labels Naxos. Statt die Liveatmosphäre zu betonen, wurde alles, was darauf verweist, eliminiert. Offenbar soll ganz bewusst Studio simuliert werden. Ich halte das für problematisch, weil solche Aufnahmen weder das eine noch das andere sind. Bei aller Perfektion des Klangbildes, bin ich mit diesem Rheingold nicht richtig warm geworden. Es wird nicht meine bevorzugte Aufnahme werden. Es packt mich nicht. Dafür ist die Konkurrenz zu mächtig. Dieser Produktion sitzen mindestens hundert andere – live und Studio – im Nacken. Das ist kaum zu glauben, aber es ist so – nachzulesen bei Andreas Ommer, der ein „Verzeichnet aller Operngesamtaufnahmen von 1907 bis zur Gegenwart“ erarbeitet hat, das in zweiter Auflage als CD-ROM veröffentlicht wurde (Verlag Directmedia Publishing – ISBN 976-3-89853-640-0). Für die Neuerscheinung spricht das Rollendebüt von Matthias Goerne als Wotan. Das ist schon mal was. Goerne hat eine große Fangemeinde, gilt als einer der vorzüglichsten Sänger der Gegenwart. Seine Domäne ist das Lied, dem er sich auch auf vielen CDs erfolgreich zugewandt hat. In Opernhäusern macht er sich rar. Auffällig ist, dass er vornehmlich Rollen singt, die auch Dietrich Fischer-Dieskau verkörpert hat – Papageno, Wolfram, Wozzeck, Lear und nun Wotan. Im Gegensatz zu seinem Lehrer will er sich auch dem wortreichen Wotan in der Walküre stellen. Die Termine in Hong Kong hat er mit dem 21. und 23. Januar kommenden Jahres auf seiner eigenen Website bereits bekannt gegeben. Mutig ist das. Goerne hat für den Wotan genug Ressourcen. Naturgemäß gelingen ihm die getragenen Passagen, wenn sich die Stimme deklamatorisch ausbreiten kann, am besten und er der versinkenden Erda zuruft: „Geheimnis-hehr / hallt mir dein Wort: / Weile, dass mehr ich wisse.“ Endlich wird einmal deutlich, dass hier etwas hallt und nichts gehalten wird. Es meldet sich der Liedsänger, der aber in anderen Momenten versagen kann. Wotans große Szene „Abendlich strahlt der Sonne Auge“ ist nicht immer auf dem Punkt – und auf dem Wort. In dramatischen Situationen und Ausbrüchen – wie sie noch mehr in der Walküre lauern – kommt Goerne an Grenzen. Seine Stimme klingt erstaunlich tief, dunkel und machtvoll, oft aber auch gaumig und verwaschen. Er ist sehr gut zu verstehen, was sich so nicht von allen Mitwirkenden sagen lässt. Wen wundert’s? Die Sänger vertreten zehn Nationen in Europa, Nordamerika und Asien. Mit dem Dirigenten Jaap van Zweden kommen noch die Niederlande hinzu. Das dürfte Rekord sein. Wo, bitte, wurde ein Rheingold so international, so global und damit politisch so zeitgemäß besetzt? Damit hätte Naxos gesondert werben können. Der Preis ist eine gewisse Unverbindlichkeit in Ausdruck und Wirkung. Donners „Dinste“, „Gedift“ und „Brike“ sind eben auch nicht mehr das, was sie mal waren. Dabei gibt sich der Ukrainer Oleksandr Pushniak, dessen Bariton immer dann wackelt, wenn er das nicht tun sollte, wirklich alle erdenkliche Mühe, seinem Auftritt – vor allem in der wichtigen Gewitterszene – auch den rechten Sinn zu verleihen. Für den Loge bringt Kim Begley zwar das passende Timbre mit, bleibt aber zu eindimensional und zu wenig pointiert. Das gilt nach meinem Eindruck auch für Alberich (Peter Sidhom), Mime (David Cangelosi), Fafner (Stephen Milling) und Froh (Charles Reid). Durch mehr Schöngesang hebt sich Kwangchul Youn (Fasolt) hervor: „Freia, die schöne, / schau ich nicht mehr: / So ist sie gelöst? / Muss ich sie lassen?“ Wunderbar! Stilvoll tritt Deborah Humble als Erda in Erscheinung, hält aber die Eleganz in ihrem magischen Auftritt bis zum Schluss nicht ganz durch. Erstaunlich ausgesungen und unstet wirkt auf mich die Fricka von Michelle DeYoung. Die Rheintöchter Eri Nakamura (Woglinde), Aurhelia Varak (Wellgunde) und Hermine Haselböck (Floßhilde) sind die Stützen der Produktion und geben am Grunde des Rheins ein hohes Niveau vor, das im weiteren Fortgang der Dinge leider nicht immer gehalten wird. Sie kommen auch im Ensemble gut zusammen und garantieren so einen versöhnlichen gesungenen Schluss. Das Orchester setzt schöne eigenen Akzenten, vor allem in der einleitenden Szene. Anderes – wie der Gewitterzauber – wirkt zu grell. Und die letzten Takte sind mir zu hastig angelegt. Da ist im Hintergrund vieles nicht zu hören, was nun mal in den Noten steht. Trotz aller Einschränkungen bin ich sehr gespannt, wie es weitergeht.